Analysts have noted a revival in investor interest in REITs recently, despite the Fed lifting US rates by another 25 basis points in June. The flight to safety amidst rising risk-aversion has been driven by escalating US-China trade tensions, an emerging market currency crisis and increased volatility in global markets. In 29 June-7 Sept 2018 (3Q18-to-date), the five best-performing constituents of the SGX S-REIT Index were: Starhill Global REIT (+10.3%), Ascendas India Trust (+9.9%), Suntec REIT (+9.5%), Keppel REIT (+9.5%), and Capitaland Commercial Trust (+7.1%). These five trusts have averaged a total return of +9.3% in the QTD. 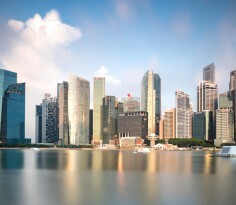 Singapore’s office market has been flagged by analysts as a preferred sector due to its improving fundamentals. A sustained rebound in office rents, modest increase in new supply, and the potential for positive rental reversions are factors seen driving a multi-year recovery in the domestic office space, DBS Vickers noted in a report published 24 August 2018. There are 34 Real Estate Investment Trusts (REITs), six stapled trusts and three property trusts listed on SGX. 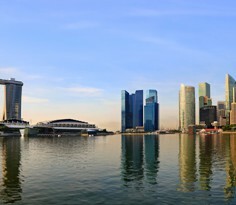 The sector has a combined market capitalisation of about S$90 billion, with Retail, Industrial and Office REITs making up the three largest segments. The SGX S-REIT Index, which comprises 36 constituents, is a free-float, market capitalisation-weighted index that tracks the performance of listed REITs in Singapore. Between 29 June 2018 and 7 September 2018 (3Q18-to-date), the Index has generated a total return of +3.5%, compared with total returns of -2.7% and -2.1% for the benchmark Straits Times Index (STI) and the broader FTSE All-Share Index respectively. Analysts have noted a revival in investor interest in REITs in recent months, despite the Federal Reserve lifting US interest rates by another 25 basis points in June. The flight to safety amidst rising risk-aversion has been driven by escalating US-China trade tensions, an emerging market currency crisis and increased volatility in global markets. In particular, Singapore’s office segment has been flagged by analysts as a preferred sector due to its improving fundamentals. A sustained rebound in office rents (grade A office rents rose 4% QoQ or 13% YoY to S$10.10 per square foot per month in the June quarter, up from the low of S$8.95 psf/mth in 1H17), modest increase in new supply over the next three years, and the potential for positive rental reversions in the near term are factors seen driving a multi-year recovery in the Singapore office market, DBS Vickers Securities noted in a report published 24 August 2018. In 3Q18-to-date, the five best-performing constituents of the SGX S-REIT Index were: Starhill Global REIT (+10.3%), Ascendas India Trust (+9.9%), Suntec REIT (+9.5%), Keppel REIT (+9.5%), and Capitaland Commercial Trust (+7.1%). These five trusts have averaged a total return of +9.3% in the quarter-to-date, bringing their one-year and three-year average total returns to +4.7% and +44.4% respectively. The table below details the 10 best-performing constituents of the SGX S-REIT Index, sorted by 3Q18-to-date total returns. Click on the stock name to view its profile in StockFacts. Among these 10 trusts, CapitaLand Mall Trust and CapitaLand Commercial Trust are constituents of the STI, while another four – Suntec REIT, Mapletree Commercial Trust, Keppel REIT, and Mapletree Industrial Trust – are on the new STI reserve list. Stocks on this list will replace any STI component that becomes ineligible due to corporate actions, before the next review. For the three months ended 30 June 2018 (4Q FY17/18), Starhill reported a 7.6% YoY fall in distribution per unit (DPU) to 1.09 Singapore cents, while gross revenue and net property income declined 3.9% and 3.3% to S$51.6 million and S$40.0 million respectively. The REIT’s full-year results were hit by weaker contributions from its office portfolio as well as disruption in income from an asset redevelopment in its retail portfolio. Looking ahead, Starhill noted that its Singapore office portfolio occupancy showed signs of recovery – reflecting the sector’s rebounding fundamentals – with committed office occupancy levels rising to 95.0% as at 30 June 2018, from 90.7% as at 31 March 2018. While the domestic retail market continues to be challenging, its portfolio has remained relatively resilient, maintaining high occupancy levels. The REIT maintains a strong financial position with stable gearing level at 35.5%. It has hedged about 96% of its borrowings as at 30 June 2018, following the purchase of new interest rate swaps to replace those maturing in 2018, largely for the S$460 million four-year and five-year term loans drawn in September 2017. It has also secured commitment to early refinance its A$63 million secured loan with the same bank ahead of its maturity in June 2019, thereby extending the average debt maturity from 3.5 years as at 30 June 2018 to approximately 3.8 years post-refinancing. Following this, there is no refinancing requirement for its debt portfolio until September 2019. For the full results release, click here. For the three months ended 30 June 2018 (1Q FY18/19), Ascendas India Trust (a-iTrust) – a pure India real estate play – reported a 23% YoY jump in DPU to 1.60 Singapore cents. Total property income fell 3% to S$44.9 million, while net property income gained 10% to S$33.6 million. a-iTrust’s gearing ratio was 31% as at 30 June 2018, and based on its current gearing limit of 45%, it has total debt headroom of S$523 million. About 73% of the Trust’s borrowings are on a fixed-interest rate basis, with 51% of total borrowings hedged into Indian Rupees. The lower percentage of fixed rate debt and hedging ratio is due to S$125 million in short-term revolving facilities that were drawn down in 1Q FY18/19 to fund investments. These short-term loans will be refinanced with long-term loans and hedged accordingly in 2Q FY18/19. The Trust noted that operationally, its committed portfolio occupancy remained healthy at 96% as at 30 June 2018. It continues to see good leasing momentum at BlueRidge 2, which has attained leasing commitment of 87%. On the investment front, it recently announced the proposed acquisitions of AURUM IT Special Economic Zone in Navi Mumbai and aVance 5 and 6 in Hyderabad, which will further boost its growth pipeline. For the three months ended 30 June 2018 (2Q18), Suntec REIT reported a 0.8% YoY decline in DPU to 2.474 Singapore cents. Gross revenue rose 3.7% to S$90.5 million, while net property income gained 2.2% to S$60.7 million, due to higher contributions from Suntec Singapore and Suntec City mall, partially offset by lower contribution from Suntec City office. The REIT noted that key operational indicators for Suntec City continued to improve. Overall committed occupancy of Suntec City mall was maintained at 98.6%, footfall increased 8.5% YoY, with the Promenade MRT station entrance continuing to register strong growth. Tenant sales per sq ft also increased 5.0% YoY. As at 30 June 2018, the committed occupancy level for Suntec City office improved to 99.7% – again in line with the sector’s rebounding fundamentals – while both One Raffles Quay and Marina Bay Financial Centre Properties enjoyed 100% committed occupancies. During 2Q18, the REIT also renewed and signed approximately 187,000 sq ft of leases, reducing the 2018 leases expiring to only 5.1% of Net Lettable Area (NLA), it added. Down under, Suntec REIT continues to enjoy growth in value for its Australian assets, with 177 Pacific Highway and Southgate Complex contributing a stable recurring income for its unitholders, it said. REITs and Stapled Trusts invest in a diversified pool of professionally managed real estate assets and raise capital to purchase primarily real estate assets, usually with a view to generate income for unit holders of the fund. Like stocks, REITs and Stapled Trusts have market risk – unit prices can move against the investor’s expectations. Other risks associated with a REIT or Stapled Trust investment can vary, and depend on the unique characteristics of each Trust (i.e. leverage ratio, cost of refinancing, alignment of management fees), as well as the geographical location and quality of the underlying property assets (i.e. concentration of properties, length of lease). Other risks associated with stock investing (i.e. price risk, volatility and liquidity risks) also apply.